He is about to clinch his 11th number one album, also giving him the landmark 1,000th chart-topping album in the UK, but will become Gary's rival on Monday when he too issues a new solo release. And although he wishes him well, Robbie says his competitive edge means he wants to be the biggest seller. 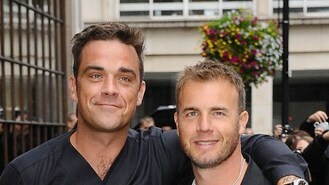 The 39-year-old said: "I've always said I want to sell a million-and-one records, and I want Gaz to sell a million. "I am in competition with everybody, absolutely everybody. When we're together we're best of mates, he's wishing me the best for this record, I'm wishing him the best for his, and what's good for us all individually is good for us as Take That. "Gaz is a very good friend of mine, and I want him to knock it out of the park next week when his album comes out, but a few yards shorter than I knock it out of the park. It's honest. I love him to bits, but I want to sell more." Robbie will equal Elvis Presley's tally of 11 chart-topping albums in the UK when Swings Both Ways climbs to the top. Gary is releasing his third solo album Since I Last Saw You.